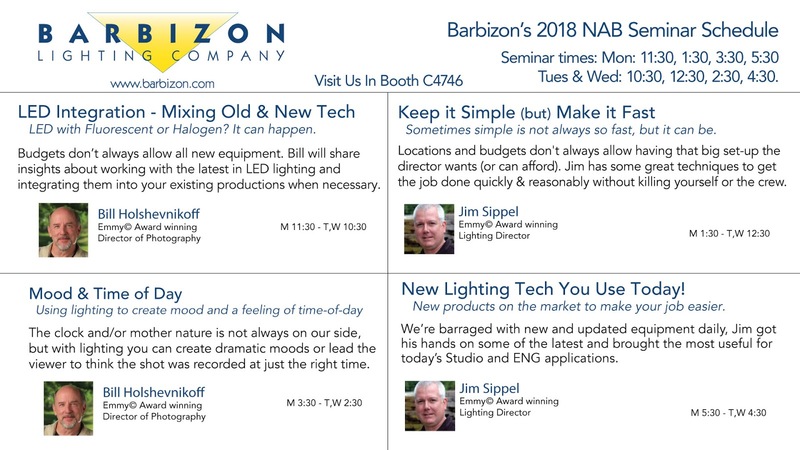 Barbizon Lighting Company Blog: Visit Barbizon Lighting at NAB 2018! 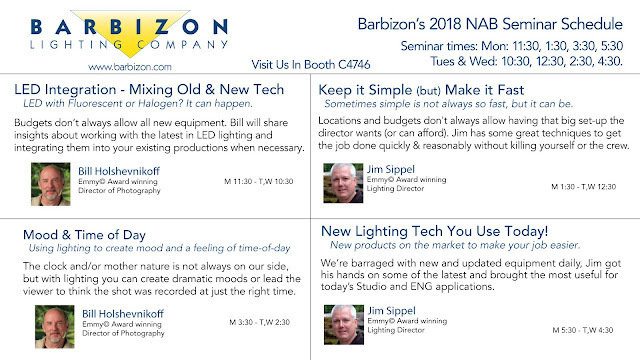 Visit Barbizon Lighting at NAB 2018! Are you headed to NAB 2018? Barbizon Lighting will be exhibiting April 9-12 at the annual NAB Convention in Las Vegas showing customers the latest and greatest advancements in broadcast and content acquisition equipment. Our booth will be located in the Central Hall in Booth C7949. For 2018 we will be continuing our free exhibit floor-based educational series covering useful topics for studio and field applications presented by Emmy© Award-winning industry veterans Bill Holshevnikoff and Jim Sippel. Our booth will also feature a wide-array of the latest lighting and content creation accessories on the market today. LED Integration - Mixing Old & New Tech - LED with Fluorescent or Halogen? It can happen. Budgets don’t always allow all new equipment. Bill Holshevnikoff will share insights about working with the latest in LED lighting and integrating them into your existing productions when necessary. The clock and/or mother nature is not always on our side, but with lighting you can create dramatic moods or lead the viewer to think the shot was recorded at just the right time. Bill Holshevnikoff will walk us through some examples. Keep it Simple (but) Make it Fast - Sometimes simple is not always so fast, but it can be. Locations and budgets don't always allow having that big set-up the director wants (or can afford). Jim Sippel has some great techniques to get the job done quickly & reasonably without killing yourself or the crew. New Lighting Tech You Use Today! - New products on the market to make your job easier. We’re barraged with new and updated equipment daily, Jim Sippel got his hands on some of the latest and brought the most useful for today’s Studio and ENG applications.